The principle of state sovereignty, enshrined in intergovernmental treaties such as the UN Charter, endows government and state officials with powers that are often unchecked and unbalanced. From a human rights perspective, the absence of a mechanism for holding such officials accountable for causing, or failing to prevent, mass atrocities such as genocide or war crimes is one of the most conspicuous lacunae in the international legal order. Over the past century, many political thinkers and leaders have recognized the need for such a mechanism, in the form of an International Criminal Court (ICC), and in aftermath of the Second World War serious efforts were made to establish it. These efforts, however, were stifled with the onset of the Cold War and resumed only when it ended. In 1995 the World Federalist Movement, which has long recognized the need for a global judicial authority, formed a broad NGO coalition for the establishment of an International Criminal Court (CICC). The coalition successfully advocated for 120 countries to sign a treaty in Rome for the establishment of the Court in 1998 (the Rome Statute), which was then ratified and entered into force in 2002. The International Criminal Court, based in The Hague, is the first permanent international judicial body capable of trying individuals for genocide, crimes against humanity and war crimes. According to the federal principle of complementarity, the court’s jurisdiction is limited only to the cases where the member states are unable or unwilling to investigate or prosecute. While this leaves the judicial primacy in the hands of the states, the final authority to determine the inability or the unwillingness of a state is the hands of the court. In this sense, as Kirsten Ainley notes, the existence of the Court challenges the notion of state sovereignty more than any other institution in the contemporary global order. A more problematic limitation to the Court’s jurisdiction is that it applies only to states who have previously accepted it, leaving out important non-member states such as the USA, Russia and China. In order to ensure that the Court’s jurisdiction will be universal, the CICC continues to advocate for more countries to sign and ratify the Rome Statute. Similarly, the coalition advocates countries to enhance their national laws in accordance with the statute to deliver justice to victims of war crimes, crimes against humanity and genocide. The Coalition for the ICC, who has today over 2,500 NGO supporters in some 150 countries, continues to work to ensure that the court will be fair, effective and independent. 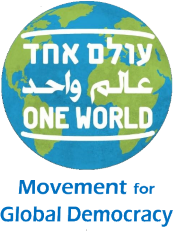 One World is a member of the Coalition for the ICC, and in collaboration with other local NGOs it helps to promote the ICC’s involvement in the Israel-Palestine situation. Such involvement, we believe, can de-escalate the threat of violence from both sides, and thus help them reach peaceful and just resolution of the conflict.